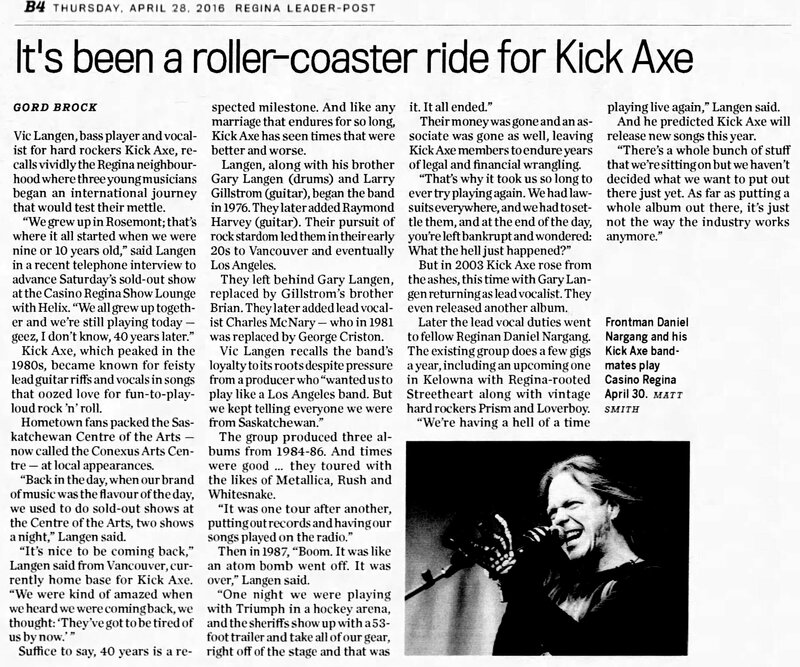 Vic Langen, bass player and vocalist for hard rockers Kick Axe, recalls vividly the Regina neighbourhood where three young musicians began an international journey that would test their mettle. 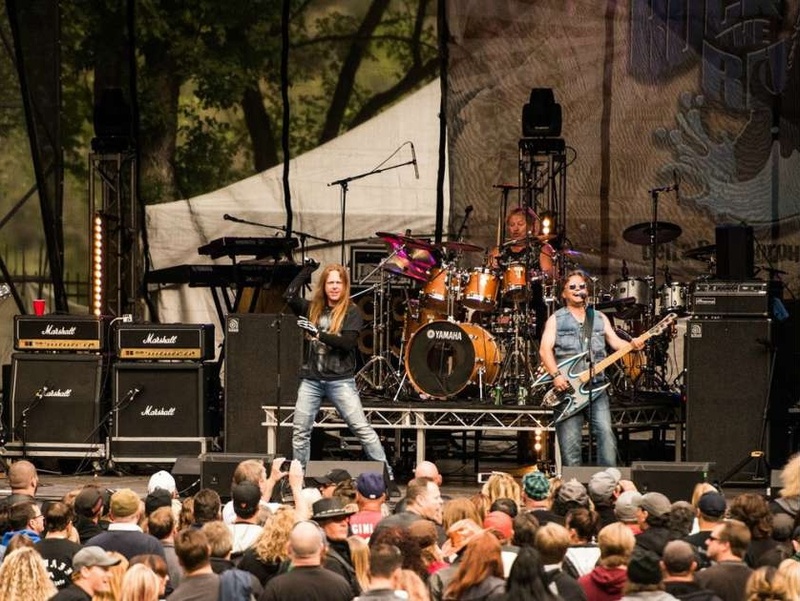 "We grew up in Rosemont, that's where we're it all started when we were nine or 10 years old," said Langen in a recent telephone interview to advance Saturday's sold out show at the Casino Regina Show Lounge with Helix. "We all grew up together and we're still playing today - geez, I don't know, 40 years later." Kick Axe, which peaked in the 1980s, became known for feisty lead guitar riffs and vocals in songs that oozed love for fun-to-play-loud rock 'n' roll. Hometown fans packed the Saskatchewan Centre of the Arts - now called the Conexus Arts Centre - at local appearances. "Back in the day, when our brand of music was the flavour of the day, we used to do sold out shows at the Centre of the Arts, two shows a night," Langen said. "It's nice to be coming back," Langen said from Vancouver, currently home base for Kick Axe. "We were kind of amazed when we heard we were coming back, we thought: 'They've got to be tired of us by now.'" Suffice to say, 40 years is a respected milestone. And like any marriage that endures for so long, Kick Axe has seen times that were better and worse. Langen, along with his brother Gary Langen (drums) and Larry Gillstrom (guitar), began the band in 1976. They later added Raymond Harvey (guitar). Their pursuit of rock stardom led them in their early 20s to Vancouver and eventually Los Angeles. They left behind Gary Langen, replaced by Gillstrom's brother Brian. They later added lead vocalist Charles McNary - who in 1981 was replaced by George Criston. Vic Langen recalls the band's loyalty to its roots despite pressure from a producer who "wanted us to play like a Los Angeles band. But we kept telling everyone we were from Saskatchewan." The group produced three albums from 1984-86. And times were good ... they toured with the likes of Metallica, Rush and Whitesnake. "It was one tour after another, putting out records and having our songs played on the radio." Then in 1987, "Boom. It was like an atom bomb went off. It was over," Langen said. "One night we were playing with Triumph in a hockey arena, and the sheriffs show up with a 53-foot trailer and take all of our gear, right off of the stage and that was it. It all ended." Their money was gone and an associate was gone as well, leaving Kick Axe members to endure years of legal and financial wrangling. "That's why it took us so long to ever try playing again. We had lawsuits everywhere, and we had to settle them, and at the end of the day, you left bankrupt and wondered: What the hell just happened?" But in 2003 Kick Axe rose from the ashes, this time with Gary Langen returning as lead vocalist. They even released another album. Later the lead vocal duties went to fellow Reginan Daniel Nargang. The existing group does a few gigs a year, including an upcoming one in Kelowna with Regina-rooted Streetheart along with vintage hard rockers Prism and Loverboy. "We're having a hell of a time playing live again," Langen said. "We still play the songs with conviction.... We're still young at heart. It's great slugging out the songs that everyone wants to hear." And he predicted Kick Axe will release new songs this year. "There's a whole bunch of stuff that we're sitting on but we haven't decided what we want to put out there just yet. As far as putting a whole album out there, it's just not the way the industry works anymore." Kick Axe, shown performing at the 2015 Rock the River classic rock festival in Saskatoon, is playing the Casino Regina Show Lounge on April 30.